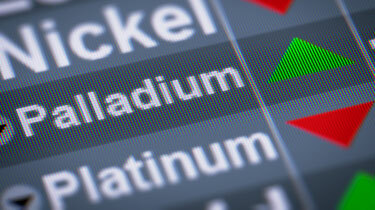 Extraordinary New Designs Mark a New Era for the Platinum Eagle! We didn't believe it when we first heard the whispers. Since its debut in 1997, the American Eagle Platinum Proof had always featured John Mercanti's gorgeous vision of the Statue of Liberty on the obverse. And while each year would bring a stunning new reverse design, Lady Liberty's crowned head appeared on the other side like clockwork. However, in 2017, word was swirling around the coin's 20th anniversary release. That proof reunited Mercanti's creation with Thomas D. Rogers Sr.'s original 1997 reverse -- a move that many saw as a final bow. Ultimately, it turned out that the rumblings were right! 2017 was indeed the farewell tour for these time-honored creations. However, it was also the prelude to a bold new adventure! Bringing the beloved series into its third decade, the United States Mint is introducing a bold and artistically rich three-year design arc to the American Eagle Platinum Proof. 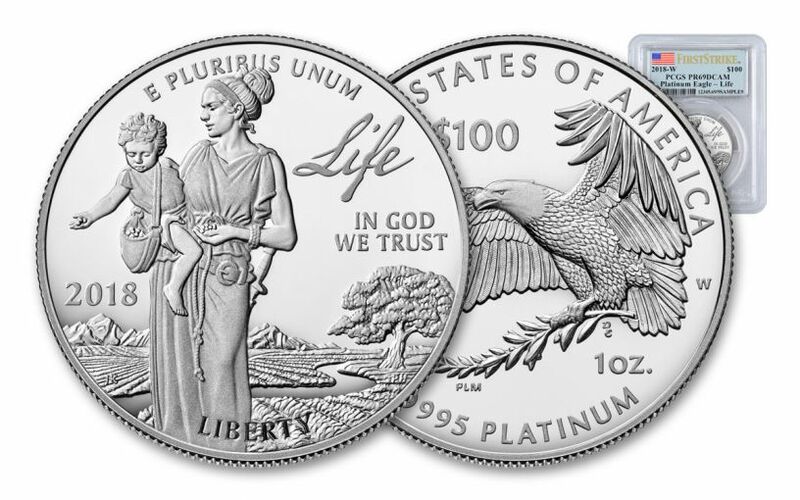 Inspired by the preamble to the Declaration of Independence, these three coins illustrate Lady Liberty guiding a young country under the self-evident truths "that all men are created equal, that they are endowed by their Creator with certain unalienable Rights, that among these are Life, Liberty and the pursuit of Happiness." First up in this numismatic trilogy is a vivid visual ode to "Life." 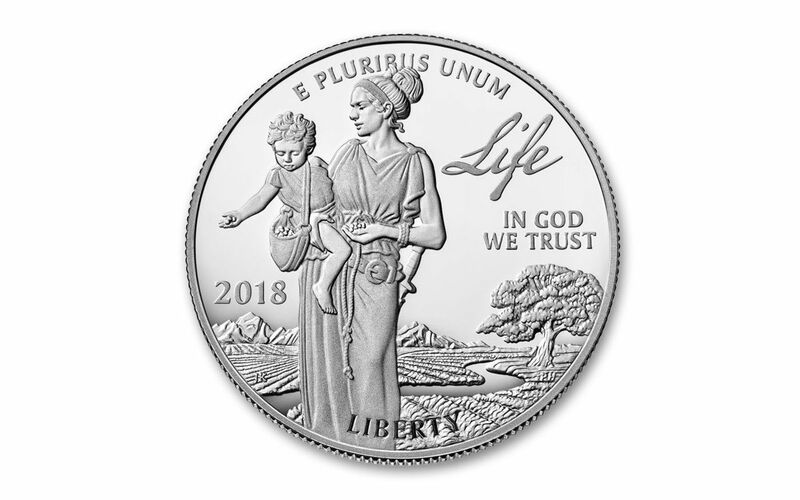 SOWING THE SEEDS OF LIFE -- Designed by Justin Kunz and sculpted by Phebe Hemphill, the coin's obverse features Lady Liberty standing with a small child in her arms. With purple mountains majesties above the (soon-to-be) fruited plains and amber waves of grain in the background, Liberty is teaching the child how to sow the fields. With her sword at her side for protection, Liberty is guiding the young one in front of a lush land -- all crowned by the word "Life" in the Declaration of Independence's original script. A MAJESTIC EAGLE TAKES FLIGHT -- While the Kunz/Hemphill obverse design will change twice more in the next two years ("Liberty" in 2019 and "Happiness" in 2020), both will feature 2018's reverse design. Here, a beautiful bald eagle shows his wingspan in flight, talons clutching an olive branch of peace. Designed by Patricia Lucas-Morris, this creation was one of the last sculpted by Don Everhart before his retirement. ANOTHER WEST POINT MASTERPIECE! -- Struck at the renowned West Point Mint, each proof begins as a carefully prepared one-ounce planchet of 99.95% pure platinum. Then, using polished dies and multiple strikes, the artisans of the United States Mint transform each blank into a true work of art, exhibiting sharp, frosted details that hover over mirror-like surfaces. 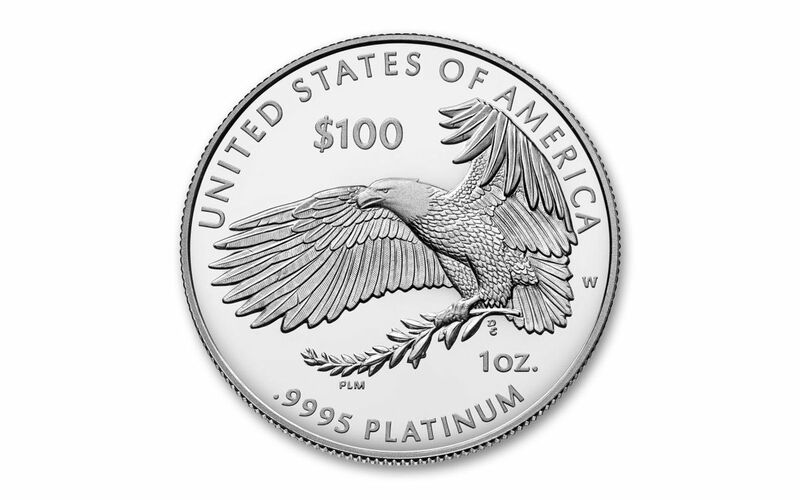 U.S. LEGAL TENDER -- Each 2018 1-oz Platinum Eagle Proof is 100 dollars United States of America legal tender, as seen on the coin's reverse. 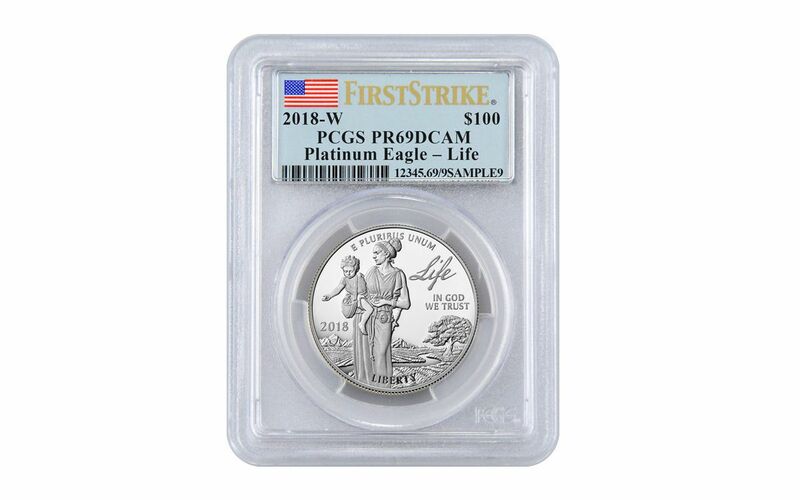 CERTIFIED NEAR-FLAWLESS -- Your coin will come certified Proof-69 Deep Cameo (PR69 DCAM) by Professional Coin Grading Service (PCGS), a distinction that means your almost-flawless 2018 1-oz Platinum Eagle Proof will showcase an impressive full strike and indistinguishable imperfections. In addition, your Platinum Eagle Proof will be certified First Strike (FS) by PCGS, meaning that it was among the first struck by the mint and was verified within the first 30 days of issue. Finally, your coin will be sonically sealed in an acrylic holder with a special American flag label, giving you the best in protection while granting clear sightlines into every beautiful detail. AN ASTOUNDINGLY LIMITED MINTAGE! -- Only 20,000 of these phenomenal proofs will ever be minted! That's right -- this debut proof has a set mintage of 20,000 for fans across the country and around the world. That may sound like a lot, but consider the fact that both 2016 and 2017 Platinum Eagle releases sold out at the mint -- not in a matter of months, weeks or even days, but MINUTES! And, with this initial release of this incredible new series, we're expecting demand to be even more frenetic. Don't miss out on this new generation of Platinum Eagles -- order yours now!